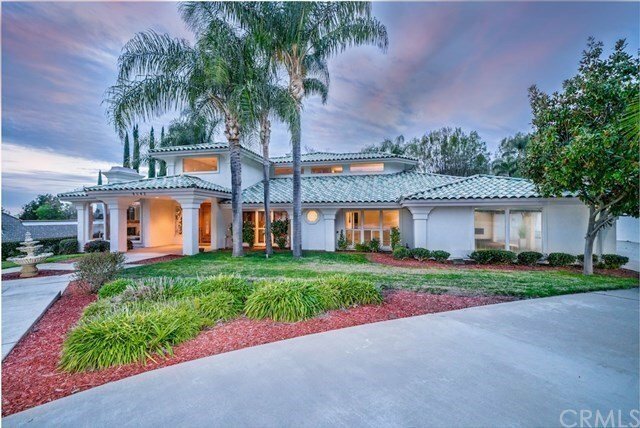 Located in the prestigious gated King Ranch community in Alta Loma. Exquisite DeBonis & Faubion custom home features high walls of glass, impressive coffered ceilings, 3 raised hearth floating fireplaces, plantation shutter, new carpet & paint with beautiful marble floors. Essentially a single story home with 2nd level dedicated to the fantastic master suite! Inviting foyer under soaring 2-story ceiling has double leaded glass doors and atrium with a view of the grounds thru large glass panes. Sunken living room with impressive fireplace and 3 windowed walls. Stately office with oak block windows, double beveled glass panel door entry, stunning coffered ceiling & built-in library. Spacious formal dining room with see-through custom display case flanked by built-in china cabinet. Family room has a floating fireplace, media center, wet bar with refrigerator & wine rack, sliding glass door leads to backyard with pool. Chef's kitchen complete with dining area, walk-in pantry, breakfast bar, brand new granite counter tops, built-in Sub Zero refrigerator, 2 sinks, and brand new Kitchen Aid stainless steel appliances. Elegant master suite features a mountain view, deck with city lights view, 3-sided fireplace, sitting area, wet bar, oversized tiled walk-in shower, jetted tub, bidet & huge walk-in closet with shelving. Manicured grounds boast swimming pool and spa. 4 car finished garage with built-in cabinets.